Breakfast times are generally hurried times in most of the households where there would be a mad rush to finish chores and generally get done with stuff.Elaborate breakfasts are pushed to the weekend to be enjoyed in leisure.In such times,instant foods come as a great boon.How about a healthy and nutritious breakfast which gets done in less than 30 minutes from start to finish including prep work? If you have tried MTR Rava idli and liked it,you'll like this idli too.Spongy,flavorsome and healthy and more so homemade and instant.Do you need any more reasons to try this one out? In a kadai dry roast the oats for 3-4 minutes,let cool and then grind to a fine powder.Keep aside. In the same pan,roast rava for 3-4 minutes,transfer to a mixing bowl. Add a tsp of oil into a kadai and splutter mustard seeds.Mix in green chilly,grated carrot and coriander leaves and saute for a minute or so. In a big mixing bowl,combine oats powder,roasted rava and the sauteed carrots along with the tempering.Add hing and salt to taste and give a good mix. Mix in the curds and enough water to make the batter. 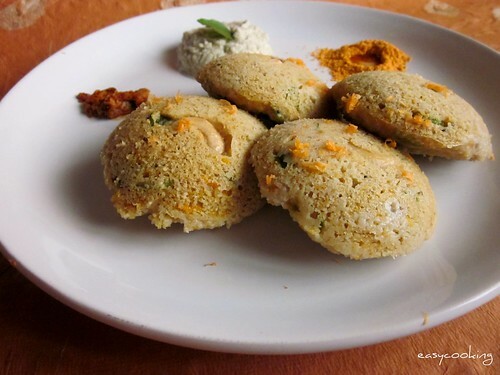 Prepare idli - Grease idli plates with a little oil and place one cashewnut half in the middle and pour idli batter on top.The said recipe yields 10 idlis. The original recipe uses wheat rava,since I didn't have it,I replaced it with regular white rava. The batter should be slightly thicker than the regular idli batter and would be a bit sticky.Pour less amount of batter per idli plate to get soft,porous idlis. Have bookmarked this from Sharmilee's space too! We can never have enough quick and healthy breakfast recipes on hand. Looks really good! Thanks for trying and glad that u liked it...this is my fav too :) Looks perfect and the texture looks very tempting. Anything with oats I just luv it :) The new template looks cool! wow such cute n yumm clicks n perfect breakfast.. I too make this wid lil changes and this is wat I had as breakfast today morning..looks yumm n nice.. Your entire plate looks like the best plate of breakfast ever! 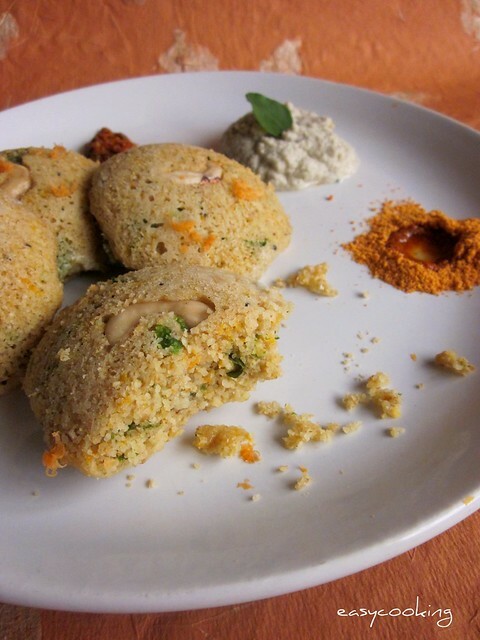 :D the podi, chutney and those wonderfully colourful idlis... im sold! just a doubt - when u say white rava, does that mean sooji rava? the one used to make upma? i'm very bad with differentiating with ravas esp since in Bombay everything is called something else like Lapsi, kansar, etc!!! I am always looking out for oats recipes. I thank you and Sharmilee for sharing this great recipe. Bookmarked! 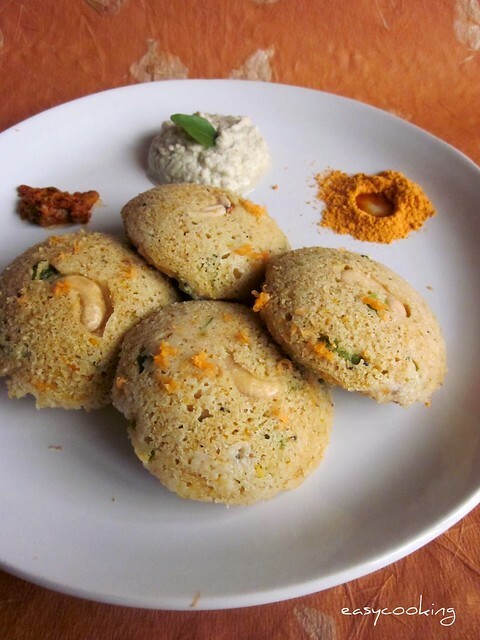 Healthy recipe with great idea of using oats....the platter looks tempting dear..
Those idlis looks awesome and love the variety of chutneys on offer!! Perfect breakfast. Wow! wonderful platter. Really droolworthy. These look too delicious and healthy. A great and healthy way to start the day. Tried your recipe, it was really yummy. Thanx for such wonderful recipes. I am new to blogging, I do not the protocol here. Correct me wherever, wherever i go wrong. Tried the idlis, it was really yummy. Thanx for wonderful recipes. I am new to blogging. I do not know the protocol. Kindly correct me whenever, wherever I go wrong.